KJV, 1611, 2011, holy Bible, Christian history, James I, Great Britain, James VI & I, birthday, publication date, Authorised King James Version, celebration, UK, memorial, Authorised, in memory, England, Cambridge, Westminster, Oxford. The Authorised Version of the holy scriptures, commonly known as the Authorized King James Version or KJV, is the word of God and the glory of the English language. For almost 400 years it has led multitudes to a saving knowledge of the Lord Jesus Christ and a whole new life in him and his word. The King James Bible has spread across the world reaching mankind generation after generation. It has saved, comforted, exhorted, rebuked, admonished, warned, enlightened, and edified without ceasing. The Authorised (British spelling) Version of the holy scriptures, commonly known as the Authorized King James Version or KJV, is the word of God and the glory of the English language. For almost 400 years it has led multitudes to a saving knowledge of the Lord Jesus Christ and a whole new life in him and his word. The King James Bible has spread across the world reaching mankind generation after generation. It has saved, comforted, exhorted, rebuked, admonished, warned, enlightened, and edified without ceasing. King James boldly testified of his faith in the Lord Jesus Christ and was very concerned about the spiritual well being of his realm. Unbeknownst to many, James I was as much of a reformer as Martin Luther was. This is easily seen when one peruses his Workes, published in 1616. Find out more about King James VI & I at this link.By divine providence, the King James Bible is still available to the true church today but, unfortunately, a plethora of modern perversions of the scriptures have sprouted forth from the earth like a field of so many tares. Men of corrupt minds have developed and sold many of these scurrilous productions that they call Bibles. Notwithstanding this grievous situation, the Authorised Version stands alone as the word of God. It is tried, true, and tested. For those that love it, the modern versions with their missing verses and inserted heresies are only impostors. The Authorized King James Bible alone speaks with the voice of authority and holiness and has done so for almost four centuries. For those looking for God, the website at this link may help you in your journey. It contains articles on heaven, hell, comparative religion, and much more; for those that are saved, the Deception Series provides critical information and insight on these last days. even modern Cambridge editions of the King James Bible do not agree with each other. This free KJV download is a good one. Translators identify King James as the principal mover of the work and reveal that they were traduced by popish and puritanical persons. Of especial note, they mention the damage that the king's "writings in defence of the truth" did to the papacy. Both the translators and the king were calumniated in the translation of the Authorised Version. Not only are the words of the Authorised Version not archaic, they are of critical importance in today's world. The Cambridge website claims that the Authorized King James Bible has never been perfectly represented in print. They have also introduced their new edition of the King James Version. This is a bold, aggressive, and startling move--essentially taking away the scriptures and replacing them with something else. King James VI & I has a message that Rome does not want you to hear. 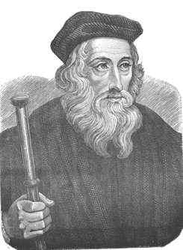 Called "the morning star of the Reformation," John Wycliffe caused a stir by preaching against the abuses and heresies of the Roman Catholic "church." He and his followers (called "Lollards") pointed people to the word of God, not the Roman Catholic hierarchy. In the 1380s, Wycliffe published the entire Bible in English. The Roman Catholic "church" burned his Bibles and his books. Approximately forty-four years after his death, in an act of contempt, the Roman Catholic "church" dug up his bones and burned them. They did not stop with Wycliffe, they also persecuted his followers like Bohemian priest John Huss who they delivered to the "secular authorities" to be burned at the stake. Translated the holy scriptures as an outlaw on the run. It is said that Tyndale was once told by a clergyman, "We had better be without God's laws than the Pope's." 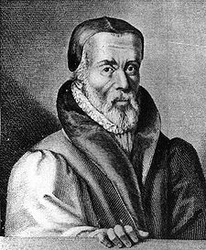 To this, Tyndale responded: "I defy the Pope, and all his laws; and if God spares my life, ere many years, I will cause the boy that driveth the plow to know more of the Scriptures than thou dost." Tyndale's translation of the New Testament was published in 1525. Roman Catholic Cardinal Thomas Wolsey demanded his arrest as an heretick. Tyndale was eventually burned at the stake during the reign of Henry VIII in 1536. 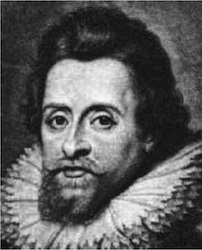 The first king of Great Britain, James I commanded the translation of the Authorised Version of the holy scriptures, identified the pope as antichrist, and through his writings (such as his "A Premonition to All Most Mightie Monarches, Kings, Free Princes, and States of Christendome" found in his Workes, pages 287-338) he was the principal force in discovering to European rulers the injuries that they had long sustained by the usurping tendencies of the Roman Catholic papacy. His defense of the Divine Right of Kingswas simply a defense of kings being able to run their own kingdoms without papal (or Jesuitical) interference. Roman Catholics (including Jesuits Owldcorne and Garnet) tried to kill King James during the infamous Gunpowder Plot of 1605. James' "Remonstrance for the Right of Kings" (Workes, pp. 381-484), explores the meddling of popes in government affairs and the devastating results of Roman Catholic recusancy. 1415 John Huss, follower of Wycliffe, burned at the stake on July 6, 1415 by order of the Roman Catholic "church." 1525 William Tyndale's New Testament published. 1588 Spanish Armada devastated in Spain's attempt to overthrow Protestant Queen Elizabeth I and make England Roman Catholic. In England, a commemorative medal of the victory was struck with the words, "God blew a nd they were scattered" inscribed on it--God was magnified for sending the fierce storms that had destroyed much of the fleet of the mighty Spanish Armada. 1603 King James' godmother and cousin, Queen Elizabeth I, dies. James crowned King James I of England. He is now King James VI (Scotland) & I (England). 1604 At the Hampton Court Conference, King James agrees that a new translation of the scriptures is in order. 1605 During the Gunpowder Plot, Roman Catholics--including Jesuits--try to blow up King James and the British Parliament. By miraculous divine intervention, the King discerned the plot (see, A Discourse of the Maner of the Discoverie of the Powder Treason, Joyned With the Examination of Some of the Prisoners," in The Workes, pp. 223-246). 1607 Colonists arrive in Jamestowne, Virginia. Jamestowne (James' namesake) will go on to become the first permanent English settlement on the American mainland thereby making King James VI & I founding monarch of the United States. 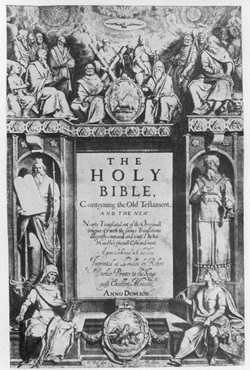 1611 Authorised Version published in May of 1611 by the Church of England. 1649 In January of 1649 King James' son, King Charles I, is executed by order of Puritan Oliver Cromwell and other insurgents after their hostile and short-lived takeover of the British government. Eikon Basilike, or, The King's Book, was written by Charles I during his captivity at Carisbrook Castle in 1648 and published posthumously. It reveals the king's thoughts and Christian testimony during his imprisonment and impending death. "I would have the weakest woman read the Gospels and Epistles of St. Paul... I would have those words translated into all languages, so that not only Scots and Irishmen, but Turks and Saracens might read them." 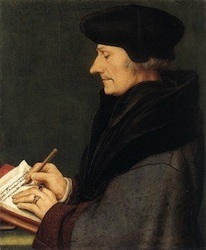 Erasmus was a brillant Dutch scholar and reformer in his own right who: (1) examined and compared various Greek manuscripts found in the finest libraries in Europe, (2) selected those renderings received by the true church throughout the ages, and (3) compiled and published his own edition of the Greek New Testament which later became known as the, "Textus Receptus"--The Received Text. The Textus Receptus was consulted during the translation of Reformation era Bibles including the Authorised Version and represents readings found in the overwhelming majority of Greek texts available in the world today. On the other hand, modern Bible versions such as the NIV are based on a small number of dissenting, obscure, minority manuscripts that disagree with the majority of extant (available) Greek manuscripts at many points and lean toward Roman Catholic readings. Some question the authenticity of Codex Sinaiticus, one of the manuscripts that a number of modern versions are based on. Some modern Bible versions appear to be based on little more than the authors' own imaginations. Keywords: KJV 1611, Authorised Version, 400th, year, anniversary, Authorized King James Bible, UK, King James Version, history, KJV, 2011, Christian history, saint, st., James, King James, holy Bible, Authorized Version, 1611 - 2011, James I, Great Britain, James VI & I.